So the Drought is Over – Now What? Have you heard the fantastic news? In 2011, we endured the worst single-year drought in Texas history. Just 19 inches of rain fell on College Station, less than half of our average. But just three months into 2012, the Bryan – College Station area already has surpassed last year’s total with more than 20 inches. As a result, landscapes are green, creeks are flowing, ponds are full and a bumper crop of wildflowers adorns our highways. The buckets of rain we’ve enjoyed also means the soil is saturated, so you don’t need to water as much. In 2011, abnormally dry conditions, or worse, existed in 100 percent of the state. This year, Brazos County is fortunate to be among the 16 percent of the state no longer experiencing drought conditions, according to the April 10 U.S. Drought Monitor map. But that means that 83 percent of Texas still is suffering a severe drought. The drought certainly isn’t over for the rice farmers who depend on water from the Lower Colorado River Authority, which had to cut water deliveries this year for the first time ever. And just because property owners on Lake Conroe can finally float their boats doesn’t mean much to parched West Texas farms and ranches. For more information about water conservation in College Station, go to cstx.gov/water or email me at jnations@cstx.gov. What do you think are the best ways to conserve water? This entry was posted on April 16, 2012 by City of College Station. 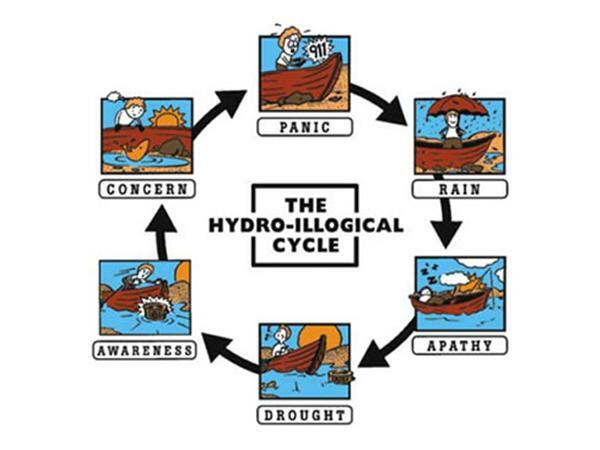 It was filed under Public Communications, Water Services and was tagged with drought, hydro-illogical cycle, hydrologic cycle, Texas drought, water, water conservation.